We have homework for you this weekend...well it's not real homework, more like yumwork. So what's the assignment? Well, the not yet released I LOVE TRADER JOE'S VEGETARIAN COOKBOOK features this yummy recipe and we thought we would share it with you so you could give it a go this weekend. 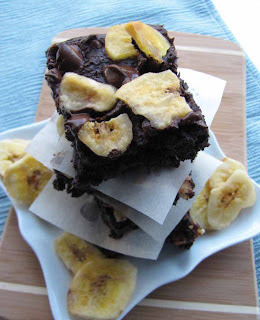 These brownies have banana coming at you in three ways: mashed in the batter, flattened into a fudgy center, and sprinkled on top for crunchy banana chip bites. The combination makes for a rich and fudgy ’nana brownie that everyone—vegan, gluten-intolerant, and otherwise—can enjoy. Preheat the oven to 350°F and lightly grease an 8-inch square baking pan or line the bottom with parchment paper. In a large bowl, mash the banana. Mix in the oil and milk with a whisk or spatula, and combine well. In two batches, add the brownie mix and stir until just combined. Spread half of the brownie-banana mixture into the prepared pan and sprinkle on ¼ cup of the chocolate chips. Peel out enough flattened banana slices to cover the first layer of the brownie mixture with one single layer. Spread the other half of the brownie-banana mixture over the banana layer. Sprinkle the top with the remaining ¼ cup chocolate chips and the banana chips. Bake until a toothpick inserted into the center comes out with moist crumbs, but no thick batter, 32 to 38 minutes. Let the brownies cool on a cooling rack for at least 25 minutes before serving.